ChiIL Live Shows has a brand spankin' new Facebook Page and we could use some like love. We'll be running loads of free downloads, worldwide tour news, live Chi, IL show dates/features in the theatre and music scene, and new artists that will only appear on our FB page. Then we'll run also run a feed from the blog with our original band video interviews, live show shots, give aways and reviews. To kick things off right, we're giving away Colin Quinn's Long Story Short DVD to one of our random likers as soon as we hit the big 100, thanks to our friends over at MVD. We're more than half way there! Every time we hit a new 100 likes we're picking one winner from our followers for new DVDs, CDs & more. 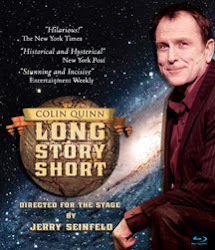 First up-this sweet DVD-Colin Quinn-Long Story Short ($19.99). Remember Colin Quinn-side kick on MTV's Remote Control? He's nobody's sidekick now!! We were front row, center on opening night, when he came through Chi-Town with his freakin' funny one man show. Now he can be all yours, to play at will, without leaving the couch. His wise and wickedly witty take on humanity and history had us laughing out loud. Even now, months later, his schtick is still stuck in my head. I can't sit down to work without his rant about bloggers and cavemen coming to mind. I'm a bit flattered, though. He mostly lampoons people groups, and only a few professions made the cut. Note to Colin...bloggers may have the cave man keyboard stance, but we're the cockroaches of the publishing world...surviving, thriving and multiplying while traditional media is dropping like the dinosaurs. I know you WANT this DVD. Colin Quinn began his comic career in New York as a regular on the comedy show circuit. Colin made his television debut as co-host of MTV's popular game show "Remote Control". Quinn landed a spot on the legendary late-night show, "Saturday Night Live" where he entertained audience for five seasons. After SNL, Quinn tackled societal issues on "Tough Crowd with Colin Quinn". Colin's first one-man show Sanctifying Grace, began off-Broadway in 1994 and was later produced as Colin Quinn - An Irish Wake and played at the Helen Hayes Theatre. Last summer, Colin appeared in the Adam Sandler comedy "Grown Ups". He can be seen in Sony's "Donny's Boy" opposite Adam Sandler and Andy Samberg, June 2012. From his personification of Caesar as the original Italian mobster, to his complaints about Ancient Greece and Antigone giving way to Costco and Snooki, Quinn is at his satirical best, taking on the attitudes, appetites and bad habits that have toppled the world's most powerful nations. First running on Broadway, then airing on HBO, the show's Broadway run was extended due to the popularity. Quinn has been touring Long Story Short throughout 2011 and took a show to the highly acclaimed Just For Laughs Festival in Montreal where it received tremendous accolades. Directed for the stage by Jerry Seinfeld, the Broadway show was produced by Eva Price and Richard Martini. Founded in 1993 by former rock critic Jonathan Gross, Video Services Corp. is a leading independent DVD distributor with offices in Los Angeles and Toronto. With a vast catalogue strong in television, sports and comedy, some of VSC's releases include the Canadian hit Corner Gas, The Roller Derby Chronicles The Tom Green Show, The WHA Chronicles and Spectacle: Elvis Costello With.... VSC also owns the e-commerce websites sportonvideo.com, laffstock.com and jewishflicks.com. MVD Entertainment Group (previously known as Music Video Distributors, Inc) was founded in 1986 by Tom Seaman, an industry veteran of more than 40 years, whose background includes retailing stints with Record Hunter, Sam Goody, Musicland, CBS Retail, and wholesale experience with Jem Records. MVD initially acted primarily as a one-stop, buying all labels' music-related VHS releases and reselling to music and video stores. In the last 10 years, MVD has transitioned from being a one stop/wholesaler for music video to a corporation consisting of three major divisions: MVD Visual, MVD Audio, and MVD Distribution. Some of the artists MVD has worked with include Sublime, Pixies, Bad Brains, Devo, The New York Dolls, Iggy Pop, the MC5, Dead Kennedys, Danzig, Marillion, Ween, Shane MacGowan, Stryper, Johnny Winter, and much more. Since 1999, MVD has released over 1500 exclusive titles. For more information, visitwww.mvdb2b.com.